Esala Poya Perahera which is also known as the tooth festival is mainly celebrated in Sri Lanka. 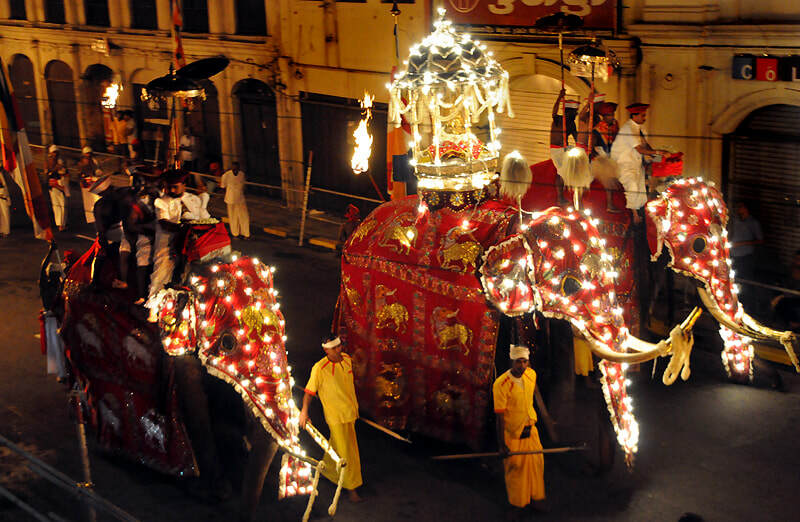 It is one of the oldest and grandest of all Buddhist festivals in Sri Lanka, featuring dancers, jugglers, musicians, fire breathers and lavishly decorated elephants. This is mainly held in Esala (June or July). According to mythology, this is the month when Buddha commemorated his first teaching after he attained enlightenment. This festival lasts for ten days. The sinhalis term “Perahera” means a parade of dancers, musicians, singers, acrobats and other performance accompanied by a large no. of comparisons tuskers and elephants parading the streets in celebration of a religious event. The festival Esala perahera is basically celebrated to honour sacred tooth relic and the four “guardian gods” of natha, Vishnu, kataragama and pattini “Devales”. In the year 1815 kandyan kingdom was captured by the Britishers and then the custody of the tooth relic was given to the Buddhist clergy, a lay custodian called diyawadana nilame was appointed to handle routine administrative matters. The rituals are performed by carrying the sacred tooth relic of the Buddha through the streets of the Kandy city which are done with the exceptional panache. It is said that this is the most beautiful pageant in the whole of Asia. The first ritual of this festival is “ kap situweema” which means the planting of a sanctified young jackfruit tree. After the plantation, the jackfruit tree is sprinkled with sandalwood scented water and the offerings are made by nine kinds of flowers and one special oil lamp is placed with nine wickes. The ritual is performed according to the time given by the astrologer, after these ritual prayers to all the gods are recited by the priest of the Vishnu temple. The Kandy Perahera features five processions organized through the Sri Dalada Maligawa, that is the most venerated Buddhist temple of Sri Lanka and 4 shrines committed to Hindu Gods and a Goddess. The Shrine of God Natha, the Shrine of God Maha Vishnu, the Shrine of God Katharagama and the Shrine of Goddess Pattini. By 8pm, the Maligawa Perahera or the procession of the Sacred Temple of the Tooth takes the lead and are joined with the aid of the processions of the 4 Hindu shrines. The 2d procession is from the shrine committed to God Natha. The 14th Century shrine that faces the Sri Dalada Maligawa is stated to be the oldest edifice in Kandy. The 0.33 is from the shrine dedicated to God Vishnu. The Vishnu Devale also was known as the Maha Devale is located close to the Natha Devale. The fourth procession is from the Kataragama Devale devoted to the God of Skanda, the deity of Kataragama. The Kataragama shrine is positioned alongside Kottugodalle Street of Kandy. This procession consists of Kavadi, the peacock dance, in which pilgrim dancers carry semicircular wooden contraptions studded with peacock feathers on their shoulders. The fifth and very last procession is from the shrine dedicated to goddess Pattini. The Pattini shrine is placed closer to the west of the Natha Devale. Following the decree of King Kirthisiri Meghawanna that the Relic should be taken around the town of Anuradhapura as soon as a year, the Esala Perahera had been observed via the succession of kings, although with interruptions caused by overseas invasions. The main purpose of this festival is to get the blessings of the Gods so that it rains and the crop cultivation can be done and the farmer land always stay enriched of the kingdom. The festival Kandy perahera started with the arrival of prince Dantaha and princess Hemamala, the son-in-law and daughter of King Guhasiva of Kalinga to Sri Lanka during the reign of King kirthisiri meghawanna (305 - 331 AD). Following the decree of King Kirthisiri Meghawanna that the Relic should be taken around the town of Anuradhapura as soon as a year, the Esala Perahera had been observed via the succession of kings, although with interruptions caused by overseas invasions. The maximum revealing narration of the Esala Perehera is discovered inside the book written by means of the Chinese pilgrim ‘Fa Hien’ who visited Sri Lanka within the 5th century sporadic invasions by means of the Dravidian Kingdoms resulted inside the transferring of the seat of the dominion from Anuradhapura to Polonnaruwa, then to Dambadeniya and thereafter to different cities. In each retreat, a brand new temple was built to enshrine the Sacred Tooth Relic. Finally, after the shift of the capital to Kandy, the Relic has been undisturbed. Ever on account that and the Esala Perahera has been held yearly to rejoice and honour the Sacred Tooth Relic. The Kandy Esala Perahera is believed to be a fusion of two separate but interconnected Perahera’s – The Esala and Dalada. It is a very grand affair with elegant costumes and is celebrated either in July or August depending on the Full Moon Poya Day. The Esala Perahera which is thought to date back to the 3rd century BC was a ritual enacted to request the gods for rainfall. While the Dalada Perahera is believed to have begun when the Sacred Tooth Relic of the Buddha was brought to Sri Lanka from India during the 4th Century AD.